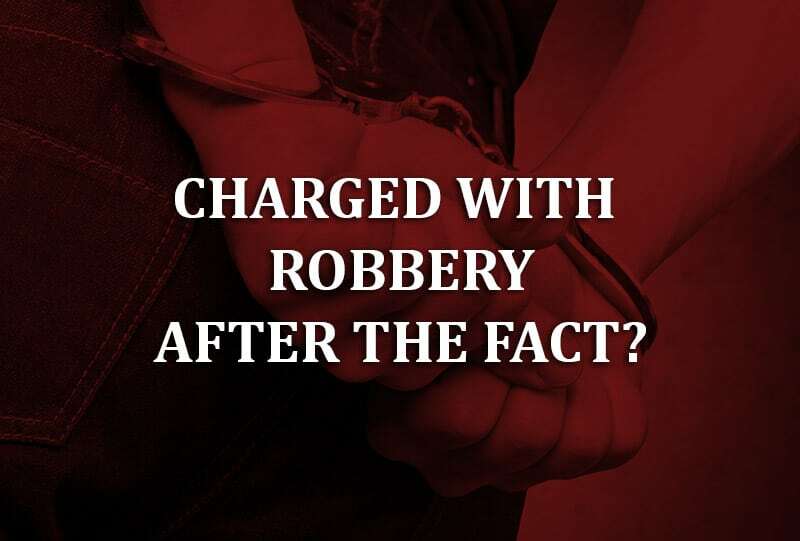 What Happens When Charged with Robbery After the Fact? Being charged with robbery after the fact is a serious matter. If you have been charged with armed robbery, it is crucial to learn how to move forward best. Understanding what the different types of robbery are and what evidence is needed for a robbery conviction is your first step except maybe calling a robbery defense lawyer. You are an adult male who lives alone. It is Christmas Eve, and you are off work. Your family and friends are all busy preparing for the holiday, so you decide to stay home. Unfortunately, that very night a string of robberies take place, and you and the masked perpetrator have a similar build. Later that night, you leave your home to get something to eat and are arrested for and eventually charged with armed robbery. What exactly were you charged with, and what evidence is needed for a conviction? In understanding what you were charged with, it is essential to get a grasp of the different types of robbery and crimes related to robbery. Larceny is when someone unlawfully takes property from its owner without the owner’s consent. For a theft to be considered larceny, the thief must intend to deprive the owner of the property permanently. False pretense is the crime of intentionally deceiving or tricking a property owner into giving away their right to a piece of property. Burglary is when someone unlawfully enters into a structure with the intent to commit a crime. Burglary does not require that the intended crime is committed nor does it require that the intended crime is theft. Robbery is the crime is when someone uses force or the threat of force to take property from another. Armed robbery is when the crime of robbery is committed while using a deadly weapon. There are two separate but equally important standards of evidence the state must surpass to arrest and prosecute someone for armed robbery successfully. Probable cause is the evidential standard the state needs to meet before making a warrantless arrest. If an officer has a warrant for arrest, then this standard does not need to be met. The probable cause standard is that an officer must have a fact-based reason for believing a crime was or is being committed. If an officer makes a warrantless arrest without probable cause, then the charge should be dismissed. Meaning, if you were arrested for armed robbery and the arresting officer did not have probable cause, your case should be dismissed. Reasonable doubt is the evidential standard the state needs of meet to convict someone of a crime. The reasonable doubt standard is placed upon jurors deciding guilt in many criminal cases. For the prosecution to pass the reasonable doubt standard, it needs to provide enough evidence to the jury to convince them that the alleged crime was undoubtedly committed by the accused. For you to be convicted of armed robbery, the state must prove beyond a reasonable doubt that you used a deadly weapon to force or threaten someone into giving you their property. If the state fails to provide the jury with enough evidence to convince them that you committed armed robbery, then you should be acquitted. Another crime that is closely related to robbery is accessory to robbery. The difference between a crime like armed robbery and accessory to armed robbery is simple. Armed robbery occurs when someone commits the crime of armed robbery and accessory to armed robbery occurs when someone assists another person in committing armed robbery. An accessory to armed robbery charge is a criminal charge. The penalties for accessory to armed robbery varies from state to state. In Nevada, accessory to any felony carries a 1-5-year prison sentence and an optional fine of up to $10,000. For this reason, you must consider hiring an experienced criminal defense attorney to ensure your rights are protected. Disclaimer: This website is designed as an information resource only. None of the claims made should be construed as legal advice or promises of a successful outcome to a specific case.